Everyone loves a good card game, adults and kids alike. Keep these best-sellers on your store shelves to see consistent sales - they're fun to demo, too. SET® ? The Family Game of Visual Perception® by SET ENTERPRISES INC.
— “It's a really great game, one that we sell day in and day out,” Sally Lesser, owner of Henry Bear’s Park in Massachusetts, told TDmonthly in spring 2007. — Two of 63 retailers mentioned Set when asked about their overall best-selling toy or game in September 2008. Ten of 64 retailers named Set as a best-selling card game in August 2008, and more than 25 percent of 38 retailers said the same in late summer 2009. In Feb. 2010, five of 38 retailers cited it as a top-selling game. — “[Set is] popular mainly because all ages can play it at the same time,” pointed out Greg Bonner, owner of Heights Toy Center in Little Rock, Ark., in summer 2008. — In a late summer 2010 TDmonthly survey, 23 percent of 43 retailers surveyed named SET a best-selling card game. Skip-Bo provides card game players with some sharp-minded fun. From the makers of UNO, Skip-Bo is the ultimate sequencing game. Players create sequential stacks of cards. The first to use all their cards wins the game. It's designed to be played by two to six players and a game takes less then thirty minutes to complete. Yes, it takes skill, but it also takes a bit of luck, too. — Skip-Bo was among the classic card games that sell well in the store of Phil Wrzesinki, owner of Toy House and Baby Too in Jackson, MI. Phase 10™ is the world’s best-selling rummy–type card game. For 25 years, Phase 10 has delighted more than 30 million card players across the country. The 25th Anniversary edition celebrates the Phase 10 player with a brushed aluminum carrying case and premium cards. A royally rousing card game! Sleeping Queens is a fun new strategy game invented by an eight-year old. The Pancake Queen, the Ladybug Queen and ten of their closest friends have fallen under a sleeping spell and it´s your job to wake them up. Use quick thinking and a little luck to wake these napping nobles from their royal slumbers. Play a knight to steal a queen or take a chance on a juggling jester. But watch out for wicked potions and dastardly dragons! The player who wakes the most queens wins. — Tova Rubin, manager at Toytraders in Lakewood, N.J., said this is one of her top-selling card games. — This is a popular choice at White Rabbit Toys in Ann Arbor, Mich., according to store manager Cheri Sims. — Casey Sartain, son and buyer at Tutoring Toy in Salt Lake City, attributes the success of this game to the fact that a younger group can play it and that they enjoy the action of slapping cards down on the pile. — Seven percent of 43 retailers named Sleeping Queens a top-selling card game in a summer 2010 TDmonthly survey. In August 2010, Shana Hack, owner of Moon Rabbit Toys in Santa Fe, New Mex., told TDmonthly her store sells about 12 Sleeping Queens games per month. 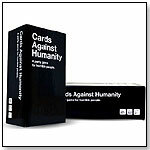 Cards Against Humanity is a "party game for horrible people." The game is simple. Each round, one player asks a question from a Black Card, and everyone else answers with their funniest White Card. Includes 550 cards (460 White cards and 90 Black cards); over 13 duodecillion possible rounds (10^40) with 6 players; professionally printed on premium playing cards; includes game rules and alternate rules; shrink-wrapped in a custom box. 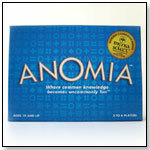 — As of 12/17/2012 this product had 4.9 out of 5 stars from 865 reviews on Amazon.com. Pros: Very interactive; humorous; great party game. Cons: One reviewer said some of the cards were "a bit too much;" some references might not be known by everyone.